Nightmare's Fear Factory haunted house of Niagra Falls, Canada has a photobooth at a freaky stage of their experience. The results are posted on a Flickr stream. Oh and they are hilarious. Hahahahahah. There are hundreds more like this, so be sure to check them out. 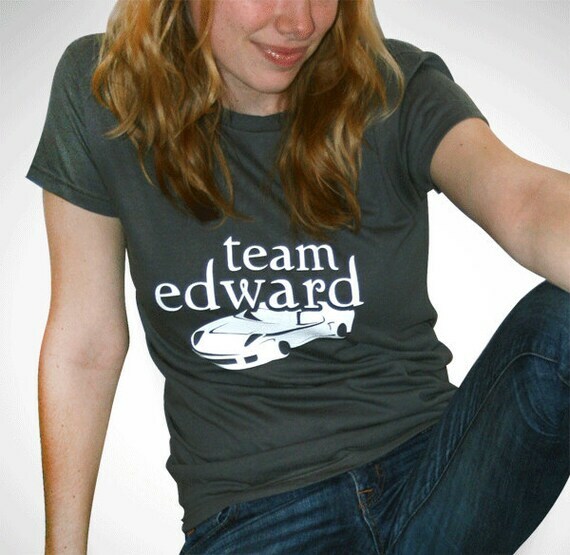 Twilight shirts are back on sale in time for Breaking Dawn! Halloween can get a little weird. 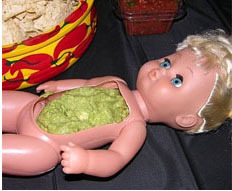 Don't serve these if I'm coming to your party. Everyone have a scary weekend! Happy week before Halloween! I have some themed posts planned for the week. I don't know. Too far? Or appropriately Halloween? Apparently Breaking Dawn Part 1 arrives on November 18th. I had no idea it was coming up so soon! Maybe I've been too focused on The Hunger Games to notice. Maybe my brain has room for one mega sci-fi/fantasy series at a time. But because Twilight time has dawned again, it's time to break out the tees! I have limited stock available on these, (all the Team Mike shirts are sold out!). This post is a little bit of double announcement. 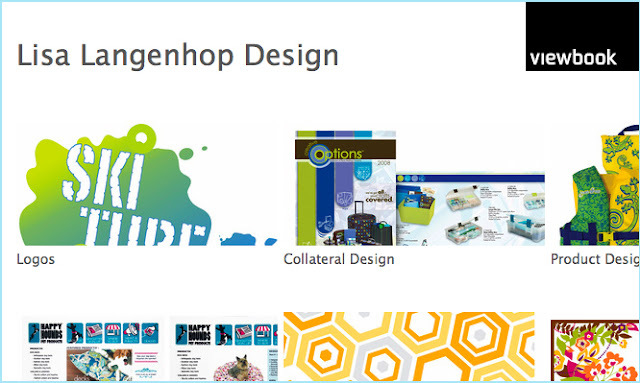 I've launched my Etsy store : L-HopDesigns. 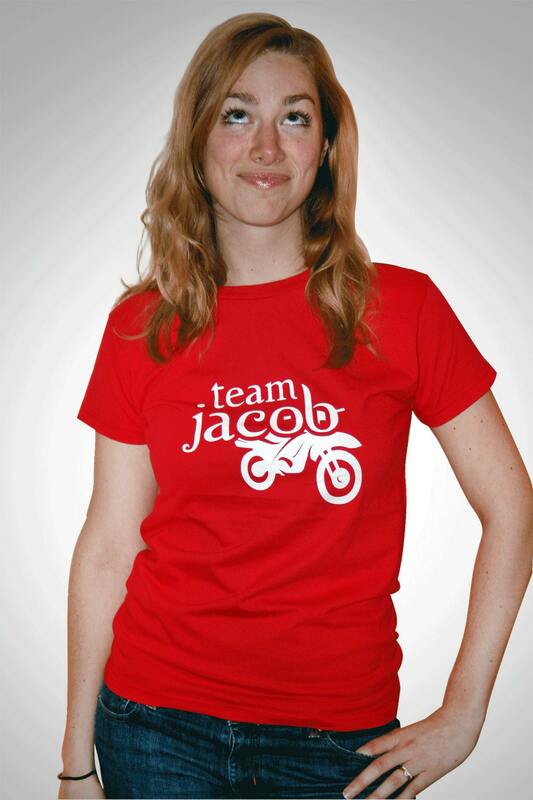 I'll make a more formal introduction when it's fully loaded, but for now, you can purchase Team Twilight shirts there. So check them out and stock up for the Breaking Dawn premier! I'm cutting the week short because Kansas is in my plans! Kansas! Sweet homeland. Though it is only Thursday, I'm signing off with my regular Friday post. These children's posters by Christian Jackson excite me on two levels : 1. Fairy tales. 2. Great minimal and symbolic graphic design. Only two posts to review from this short week! Everyone have a minimal weekend! Hm. Put a positive spin on that please. It's at every retail level now : Chevron. Chevron is in fashion, home décor, technology, DIY. You can't follow blogs or watch TV without encountering it. Why do we love chevron? It's geometric, but traditional. It's bold, but not wild. It is flexible, but simple. 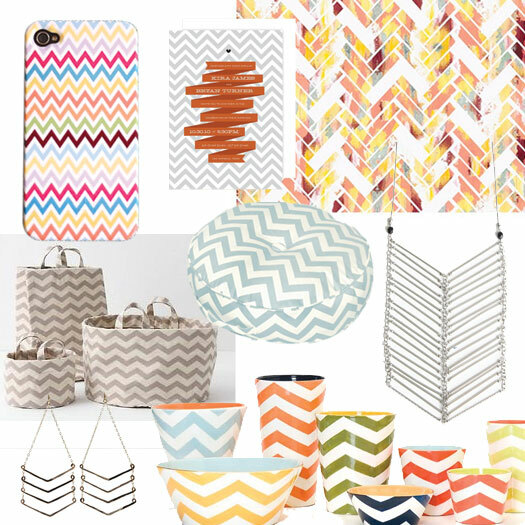 This is an assemblage of some of my favorite easy to utilize chevron products. 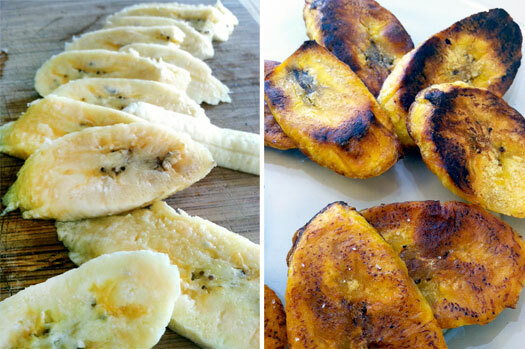 In Haiti, we practically ate fried plantains at every sit-down meal. So when I saw plantains as the local market this weekend, I decided to give it a shot. 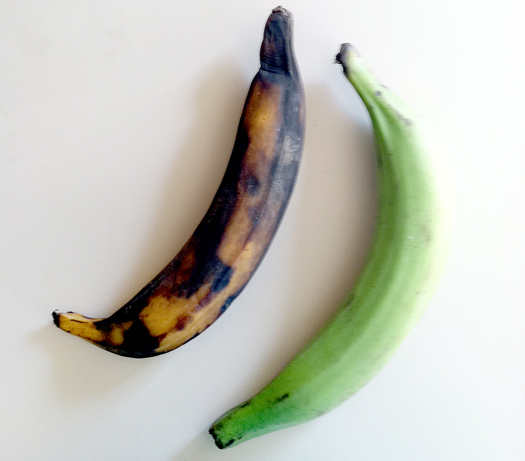 (Quick side note : Not knowing whether to purchase a very ripe plantain or a rather green one, I bought both. Turns out, at least for frying, the green plantain was best. 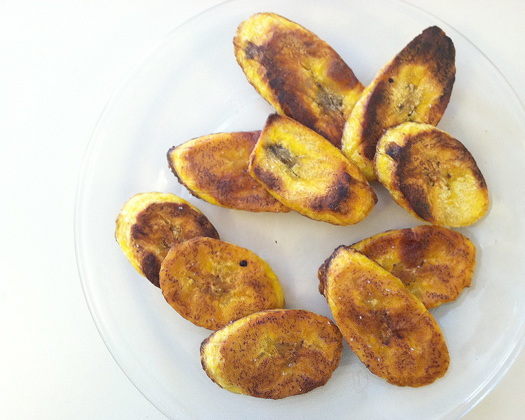 When oil is hot, place plantain slices in a single layer in the skillet. Fry for about 5 minutes on each side, or until golden brown and crispy. Remove slices from the pan and drain on paper towels. Immediately after removing from heat, sprinkle the slices with sea salt on both sides. Serve as soon as they are cool enough to eat! Helloooooooo Friday! You are most welcome here. 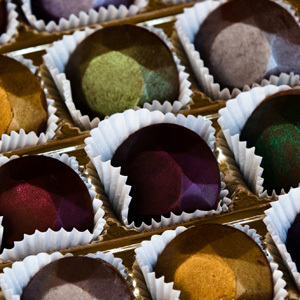 Take a gander at these luxurious chocolates from Promise Me Chocolate. The company has gotten lot of attention from event planning magazines, for obvious reasons. 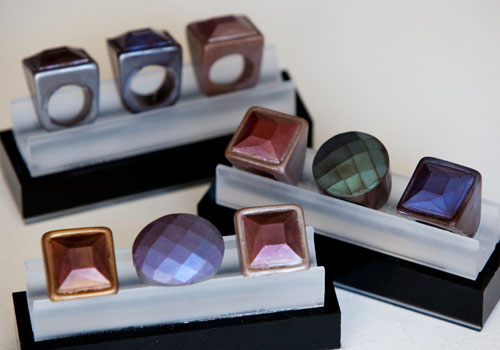 They offer truffles, solid chocolates, and mint patty gems as well as actual chocolate rings. I think they are fabulous! 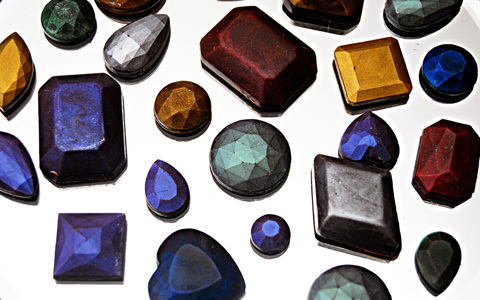 I suppose, after all these years, colorful gem stones still capture my imagination. Particularly edible ones. A summary of wonderful things about the autumn season. Crayola® Color Guide for the soothing Sea Green. My 6 Tips on how to shop for designer clothes for less. Have a decadent weekend! Ciao! Yet when it comes to clothing, I still experience extreme sticker shock for designer labels. I just. can't. pay. that. much. Not complaining, just explaining. I am stuck between the lasting value of nice clothes, and the short term value of cash flow and savings. Get in Touch with the label. This always works best at the end of a season and with smaller labels. Just shoot an email to their contact address. Ask if there are any sales starting soon, if they are having any shows, and mention specific items you have noticed. Be complimentary, open, and friendly. Help them want to help you! The goal is to get insider tips and directions to their outlet avenues. 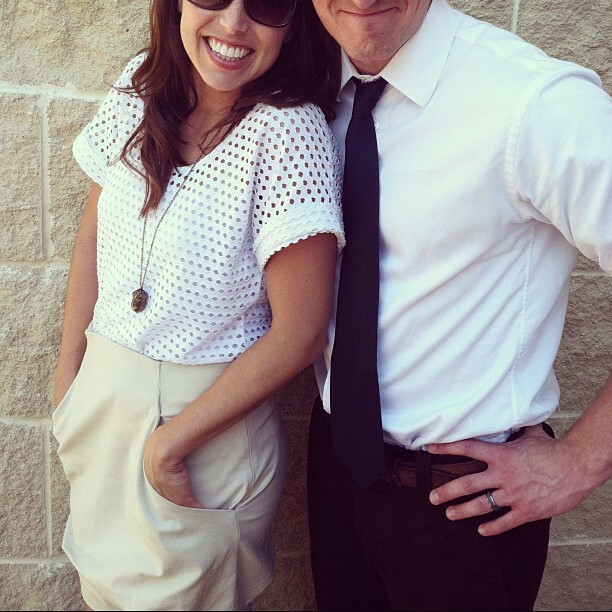 For my rehearsal dinner, I had my eye on a summery $450 Lauren Moffatt dress. I emailed, and Lauren herself wrote back that a sample sale was on the books for the following week. She sold me the sample dress for $150! Utilize flash sale sites. Flash sale sites are a great way to find hit or miss designer clothes as great prices...often 30-60% off retail. It does take some effort, as you have to sign up for (free) accounts and sift through all of the items offered. If you are online shopping comfortable, this is a great fit for you. My favorites are hautelook.com, ideeli.com, theoutnet.com. I scored a French Connection sheath dress for $27 on ideeli.com. Facebook your favorite labels. Facebook is the perfect way to interface with your brands. 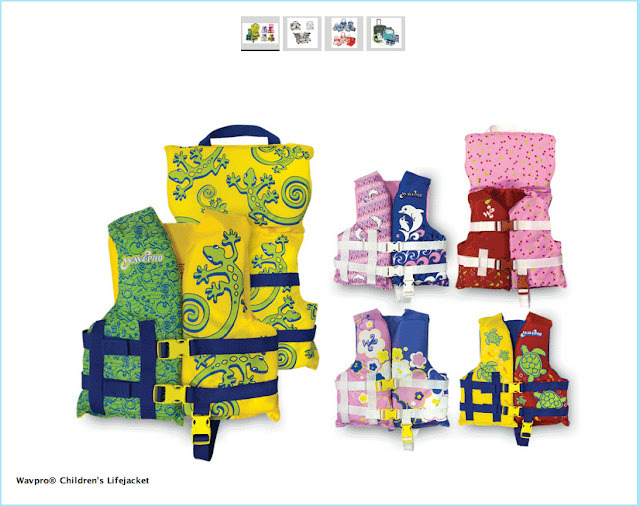 When you "like" a label, you will be kept abreast of sales, shows, and new designs. Often brands will provide special information and perks to their Facebook community. In addition, you can interact with actual people at the brand. Ask questions, establish communication, be a brand proponent. Sometimes you'll be personally rewarded! You can read sister Annie's (the non-nun) David Aubrey success story here. 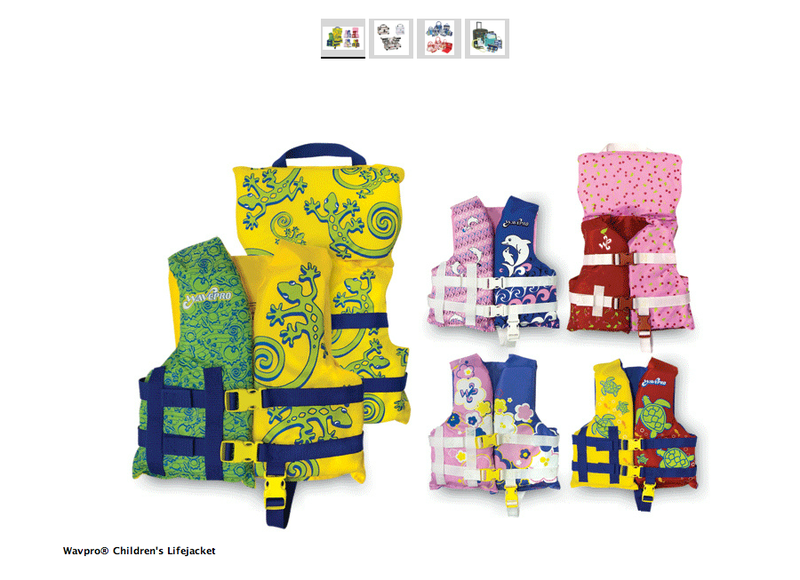 Shop at designer discount stores. This category includes TJMaxx, Marshalls, and Nordstrom Rack.Though shopping this way is very hit or miss, these stores regularly have items from Lucky, 7 for all Mankind, True Religion, Tommy, BCBG, etc. I buy all of my denim in this category. Prices are easily 30-50% off. All that being said, please know that a very limited amount of my clothing is actually designer labels. I try to be selective and purposeful about which items are in need of high-quality status. Almost all of my shirts, accessories, tanks, utility clothes, swim suits, etc. are inexpensive brands like Target or H&M. There is logic for both categories in my life! Happy smart shopping! If you snag anything great, I'd love to hear about it! This is a very soothing color. 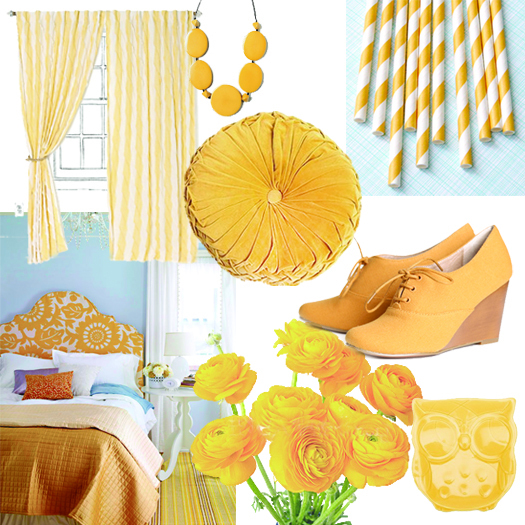 It's a color that seems old fashioned but refreshing at the same time. Freshly traditional, if you will. 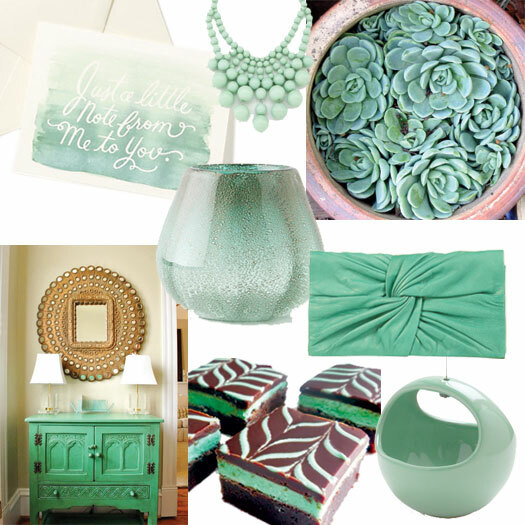 This color guide is based on Crayola®'s Sea Green. Awesome chest from an unsourced image on Pinterest...anywhere know where this is from? Be sure to check out the rest of the Crayola® Color Guides here. This year I have been struggling during the change to autumn. I have been mourning the summer, and a slight dread of winter is tickling my brain stem. However I do believe in rejoicing in what I have, so I am going to fight it with a list of glorious, beautiful, or tasty things about the fall! Will you help me write this list? What else is wonderful about autumn? 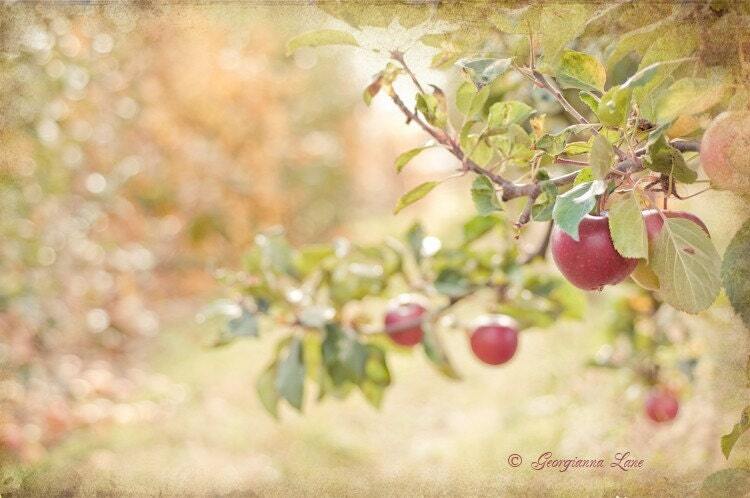 I recommend Honeycrisps and a new breed we discovered at the farmers market : Newtown Pippins. Casual chic! Or formal with edge! That's the glory of boots...there are so many kinds. Fresh air, cooler temperatures, no humidity. Adult dress up? I'm all over it. In the morning the heater is on. I get out of bed, grab breakfast and a blanket, and sit directly atop the floor vent...trapping all the warm air around me. This is my cold weather morning comfort ritual, and I do louve it. There is nothing as comfy as a floppy warm sweater. Back at the beginning of the year, I posted about the rise in fox designs. At that point, it was merely something I noticed, but I have grown into an active participant. Now I have a "thing" for foxes. 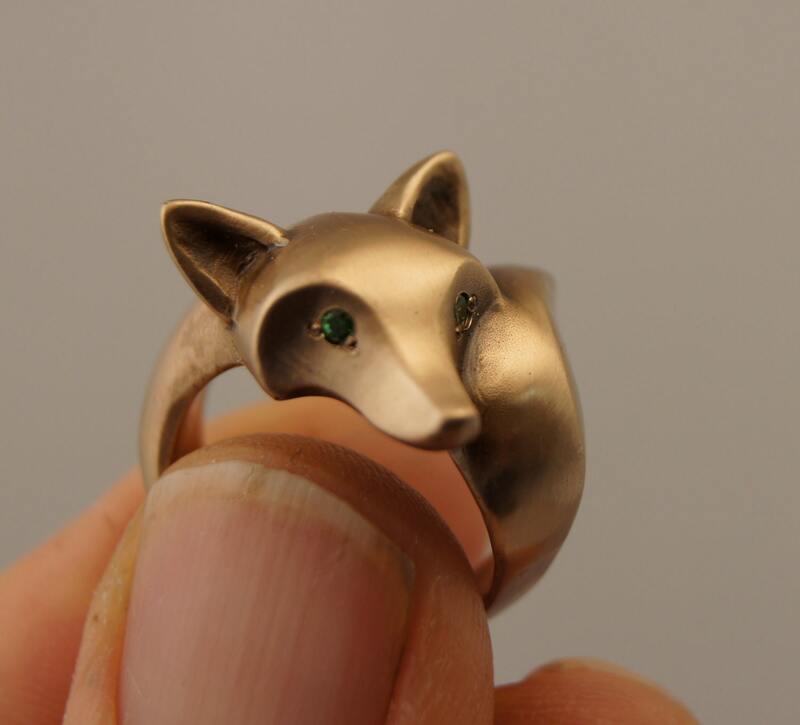 The Bronze Fox Ring encapsulates the essence of a fox (the ears, nose, and tail) but manages to be so simple. Christmas list! Christmas list! Here's the recap...I had a ton of fun this week! I finally launched my digital design portfolio! Awesome guest post from Lauren Dixon about savvy and stylish traveling. Everyone have a foxy weekend! I used this great recipe from SmittenKitchen.com because, as mentioned in her post, the apple cider is reduced to enhance the cider flavor within the dough. 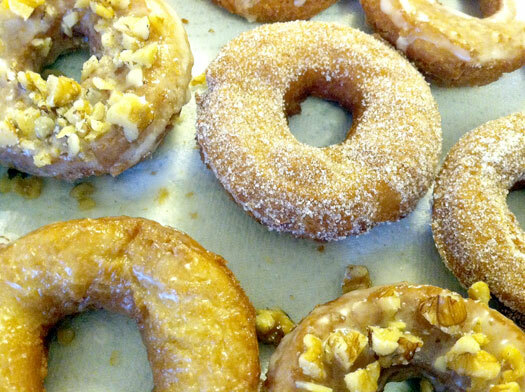 Doughnuts are a lot of work to make, but oh sooooo good in the end. These were outside crispy and inside softy. 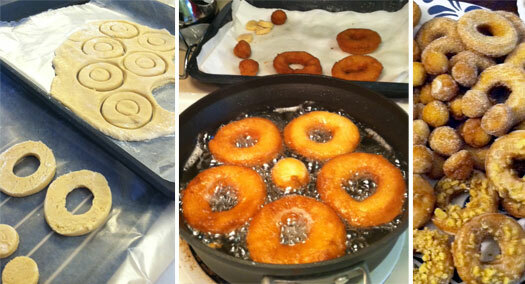 My batch yielded about 30 doughnuts though I also used approximately a 3" cutter (SmittenKitchen estimates 18). Beware you might get more than you planned. Yes, it's a good problem to have with donuts. If you don't own a doughnut cutter, use what's around the house. I used a jam jar for the shape and an Airborne® tube for the holes! Double dip all of the glazed donuts. Dip, cool, dip again. Chopped walnuts are a tasty addition to the glazed variety. The freezer and fridge time between steps is necessary, just trust me. I want to try this again soon...this time with caramel or maple frosting. Since I first met Lauren Dixon in college, she has become a globe trotting fashionista. 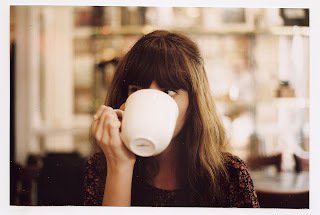 Born in the States, she now lives in Rome with her British husband. 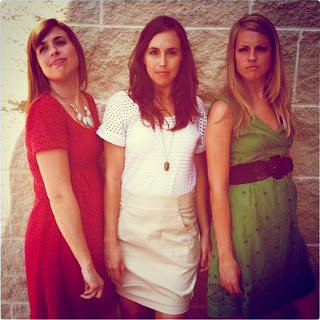 Lauren writes a lovely blog about the simple, beautiful, and inspiring things in life, simplysemplicita.com. A side note: This guide really is for Western Europe. Each culture (or set of cultures) has its own set of best practices, so I'm focussing on where I travel the most. No matter how long your trip is, only pack clothing for 7 days. This is a huge miss for a lot of Americans travelling in Europe. Europeans wear the same thing over and over, just reinventing the basics. They know what looks good on them and just keep rockin' it out. This is great because you can pick your best or favorite things to take along and won't break your back carrying your suitcase in the process. Great accessorizing is the weapon against wardrobe boredom. If you're planning on wearing the same two blazers the week you're there, bring several different chunky necklaces, hats, or scarves to change things up. Going heavy on accessories and light on clothes makes everything lighter anyway. Pack a small bottle of detergent. I've just started doing this and haven't regretted it. This means I can give a quick hand wash to a basic and have it ready for the next day. You can buy refillable bottles and bring it along. Leave your jogging shoes at home. Nothing says "American" like a good pair of white tennies. If you'd like a more casual and comfortable feel, bring some Converse sneakers or other street shoes. Bring a handbag that zips. Unfortunately pick pocketing does happen. And not matter how hard you try, you will most likely still be a target. Be smart but leave any sort of "clip around your waist or hang around your neck apparatus at home." After all, this is just Europe, people. Bring something to go out on the town. I always travel on a tight budget, but still am a firm believer that food is essential to toursim. If you're also in this camp, skimp on lunch by buying food from a supermarket or farmers market and save up for a nice meal out. No matter if you're a splurge-one-night or out-every-night-type of traveller, make meals part of your experiences. Return to your room and freshen up before your 8pm (or later) meal. Get chic! Bring something fabulous to wander the streets in at night. You won't be overdressed, trust me. As you can tell, my mantra really is pack light and simple. You'll be glad you did and you'll be more like a European anyway! I hope you've enjoyed this quick set of suggestions. Read more travel guides and general celebrations of all things simple on my blog, www.simplysemplicita.com! I have finally launched my design portfolio online. Hip Hip Hooray! If a girl is going to do some freelance, she's got to be accessible! This is the first big step of many toward a more active freelance career. Again I say, Hip Hip Hooray! Please check it out and give me feedback... Let's consider this the Alpha version, as I'm sure there are updates and adjustments to make. I still plan to ad a bio/about image. Viewbook reduced the time I needed to complete the project from two weeks+ to one weekend. Viewbook allowed me to select, resize, and organize my portfolio within their platform, instead of building my own coding. Viewbook has a simple, clean format that dynamically showcases images. The interface is very easy to learn and use. Viewbook offers three levels of product with advancing features and flexibility. My website is under the most basic of plans for now. The options for layout, font, colors, etc. are quite limited, but the price is good, and the option to upgrade remains. The viewer is Flash based, so the images are harder to copy. There are so many online tools, all with different strengths and advantages. This article from webdistortion.com has a great list of online portfolio tools that guided me in my selection. Thanks to everyone who has encouraged me to move forward with all of this! Like I said above, feedback is welcome!